A tantalizing new website appeared recently, along with a series of mysterious tweets and posts offering this compelling call to action: Get Ready for the Revolution! For Artlantis fans who have anxiously been awaiting word on the next release, your wait is over: Artlantis 5 is coming soon! 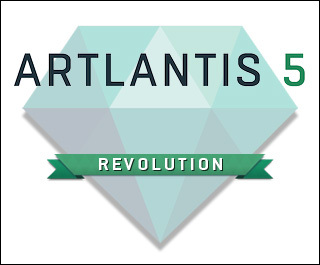 The website features a release date countdown timer, along with a series of letters that form the word “REVOLUTION.” Over time, each letter will unveil sneak peaks of some of the exciting new features of Artlantis. The first letter, R, links to an eye-popping video of a new feature that many users are sure to appreciate: Relief Mapping. We witness a stone wall transforming from a flat texture mapped surface to a truly 3D surface with plenty of depth. The video is short but impressive, and succinctly illustrates the vast potential for this feature to be used on a wide variety of building materials that architects and designers specify on a regular basis. Visit the new website and while there, be sure to sign up to the email list so that you can learn about other exciting Artlantis 5 announcements.